It only took my four months, but I finally visited the much talked about L'otus Cake Boutique! Did I mention that I live a mere two minute drive away from their storefront in Richmond? 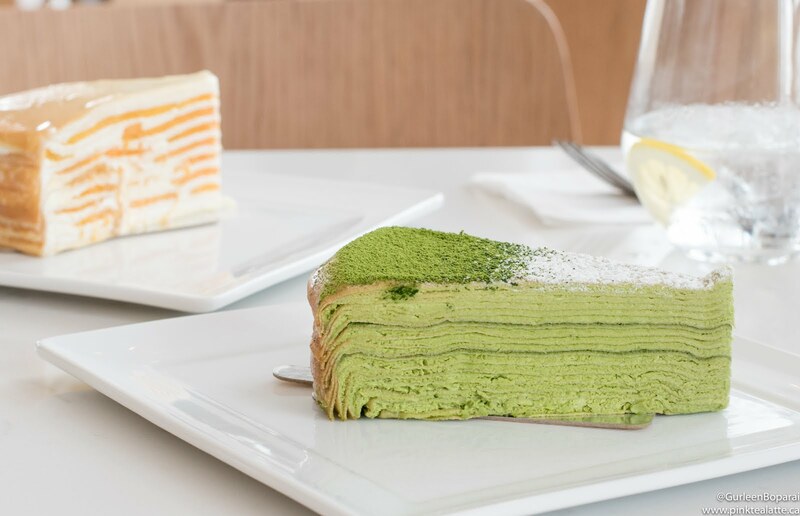 It seems like Vancouverites cannot get enough of L'otus' signature Mille Crepe Cakes as they are often sell out before closing. 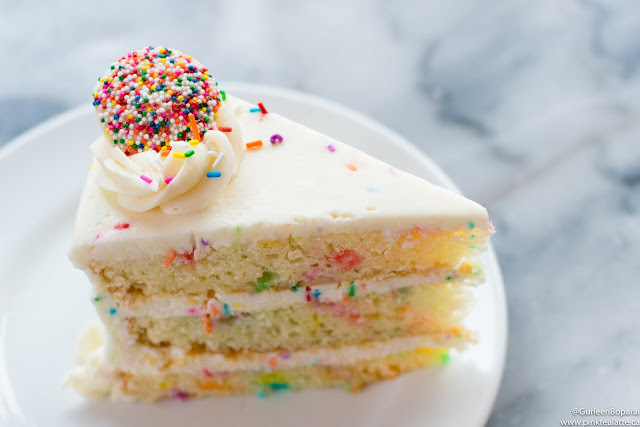 In fact, I read somewhere that it is suggested to call in advance and reserve a slice of cake to ensure you are not disappointed if they sell out. Definitely a testament to their popularity! 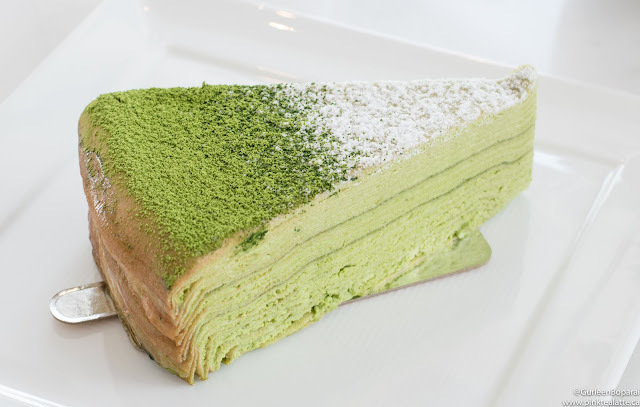 Between my friend and I, we had a slice of the Matcha Mille Crepe and the Philllipino Mango Mille Crepe cake. This was my first time trying Mille Crepe Cake and it was delicious! I now understand why everyone was so excited about Mille Crepe being available in Vancouver. I am certain you can find them else where in the Lower Mainland too, but the quality and depth of flavour may not be the same. The Matcha was heavenly with its decadent alternating layers of paper thin crepes and the smoothest matcha cream ever! I honestly could eat that matcha cream on toast every morning! I appreciated the chef focusing on highlighting the matcha flavour and did not try to overpower it with sugar. I was also very surprised by how easily I was able to cut into the cake with just the edge of my fork. We also shared the Phillipino Mango Mille Crepe which was again their paper thin crepes, but this time with alternating layers of fresh whip cream and slices of the imported mangoes from the Phillipines. The mango was delicious and had a lovely fragrant mango taste and I wish I could just take some mangoes home to eat! 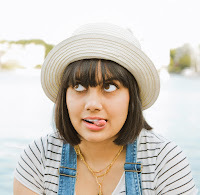 Those of you who did not know, mangoes are my favourite fruit! Between the two, I cannot pick a favourite since I equally love matcha and mangoes! Both get a huge thumbs up from me! The only downside was the price point of the individual Mille Crepe Cake slices. Each cake slice was $8, with the exception of the Phillipino Mango which was an astonishing $13! I do acknowledge that a lot of time goes into creating the many layers of the cake and the imported mango from the Philippines must be expensive; however, it still felt far too overpriced for a bakery. At restaurants, desserts are comparable in price, but you are paying for the service, atmosphere as well as how the dessert is presented. I was very disappointed by the look of the mango cake since it had zero garnish, the top was left as the plain crepe. Frankly even some piping of whipping cream and a few pieces of mango would have helped make the $13 feel a little less steep. The other cake slices had some very minimal garnishing, but still nothing that will wow you. 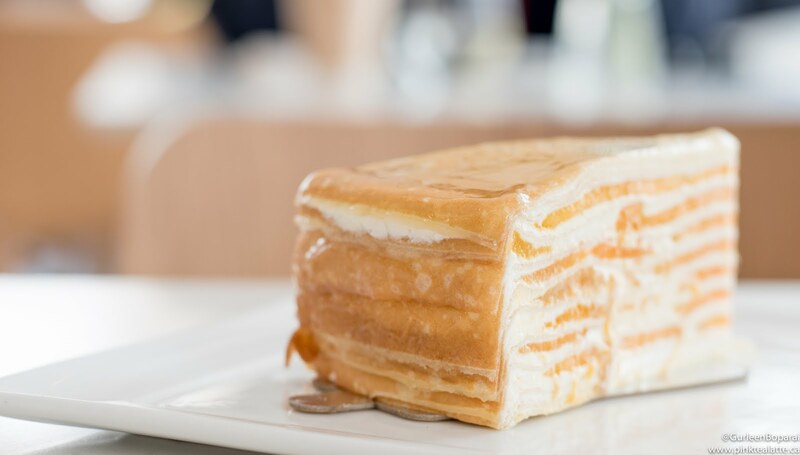 Let me know in the comments below if you love Mille Crepe and if you have tried the ones from L'otus!